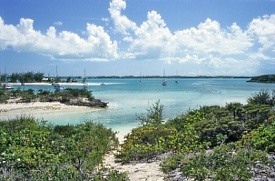 The Exuma Islands are located in the middle of Bahamas. The main attractions are the world-class sportfishing and boating. The rolling hills, wide sandy beaches, and brilliant blue waters have some of the earth's more spectacular creatures. Snorkellers and divers will find lots to explore, from the huge coral reef to Exuma Sound which is filled with caves, blue holes and shipwrecks. The Exuma Islands also claim bragging rights to their place in Hollywood, having twice been the location for James Bond films.